Where do you think it would be hardest to be a vegetarian (and eat)? Carnivals, county fairs, and theme parks top my list. I don’t know why anyone would want to eat at these places because you inevitably end up upside down (like the photo) and sick to your stomach. Theme parks are not known for great cuisine. Instead they are known for “fun” food such as fried dough, massive turkey legs, cotton candy, and hot dogs, hot dogs, hot dogs. My daughter recently decided to become a vegetarian and I wrote about my challenges in my weekly newsletter. If you don’t get it – SUBSCRIBE and it will be sent to your e-mail along with my posts. 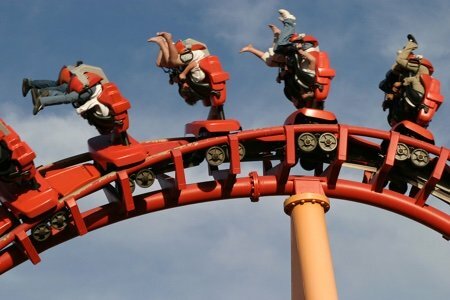 Many readers shared their experiences with me about being a vegetarian or having children that decided to become vegetarian – and gave me advice for my upcoming trip to a theme park (Busch Gardens in Williamsburg, VA). You are right, amusement parks, attractions, and even restaurants are challenging. There are certain restaurants (Chilis and Applebees come to mind) that we don't bother with because literally a dinner salad or plain baked potato is the only option that does not have some sort of meat product. We tend to eat before going to an attraction instead of at the attraction, beyond buying snacks. Thanks, Sharon!! Quite a few people replied and asked me to share what I found after I returned so I decided to write this post. What did I find? I found the usual fast food and a whole lotta BBQ meat. This place served platters (literally) of smoked sliced pork, chicken, and ribs drowned in sauce. That is right! A “garden” burger was lurking at the bottom of the menu. 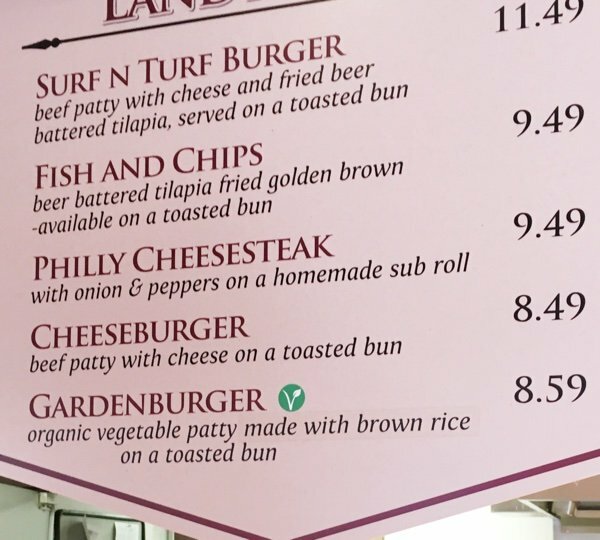 Does anyone else think the “Surf-n-Turf” sandwich (at the top of the menu) sounds gross? What are they thinking? Vegetarian lo mein! Yes, they managed to make something with vegetables instead of meat as a main course. Is it the healthiest food? No, but my daughter actually loves noodles so this was a big deal. I was happy that Busch gardens had this option. Obviously, she could have had cheese pizza or a grilled cheese sandwich but it was nice for her to have something she was excited about. I will say that she influenced my eating quite a bit as I searched the menus for vegetable options. It didn’t feel right to eat a “platter of meat” in front of her. I stuck to primarily small snacks (bag of trail mix in purse) because I didn’t want to toss my cookies into a trash can after a humongous roller coaster. Vegetarians can survive at Busch Gardens (except for the rides). 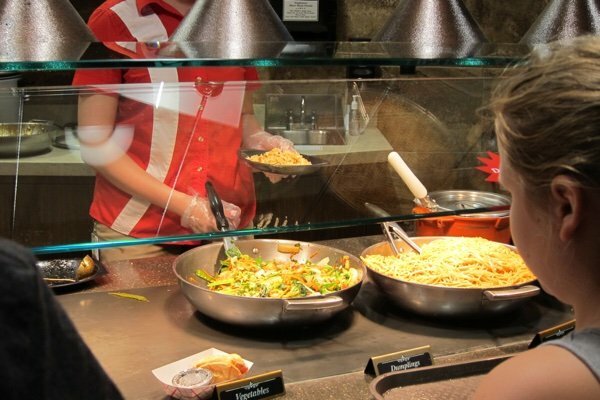 How do you eat at theme parks or attractions? Is it a struggle? Eating out in general requires a certain level of suspicion as a vegetarian. Unless a dish is marked specifically vegan, don't assume that no animal products are used. Ever try looking for gluten-free or gluten-friendly while at a theme park? I have never eaten so many French fries in my life! Theme parks definitely need to step-up their food choices. Careful with fries - always ask if they're cooked in a dedicated fryer (versus one also cooking other deep fried (aka breaded) foods)....my best friend is GF as well, and really misses fries! It is the same way with the fried tilapia, was it cooked in the same oil as other battered meat products? My friend has been an ovo-lacto vegetarian for 40 years and gets poisoned so often. After years of not having meat, its will make you hurl worse than the rollercoaster. Lisa - it is difficult to eat healthfully at theme parks. Some parks, we found out, will not allow you to bring a cooler into the park! Try being vegan! It's one of those nights in my life when I sometimes become a temporarily cheating vegan and accept that I may be consuming dairy. Meat/chicken broth are a different story altogether. It has always been difficult to eat at places like this so I generally just go for the pizza! I have also run in to the problem with Chinese food in ordering what I think is a vegetarian option but it is cooked with broth. I have learned to ask but sometimes they tell me one thing and I find it to be another! I am always happy to find a veggie wrap (Ren Fest!) and it really has become so much easier than years ago when it was always the baked potato and salad. My husband jokes that I'm a cheap date at Ruth Chris or the like because I get a salad and some vegetables or potato. Of course I make up for it with the cost with the wine! I agree. Festivals, etc. are hard spots to find ANY healthy food, vegetarian or not. Also hard for me (vegetarian) is a fish/seafood restaurant. Ditto Hawaiian restaurants. Most places here on the west-coast are pretty darn friendly to vegan, vegetarian, GF, etc. You can find more than salad a fries or ask for a chef's choice vegetarian if you don't see anything on the menu. Hey Lisa! Thanks for featuring some of my comments in your article, I am honored. 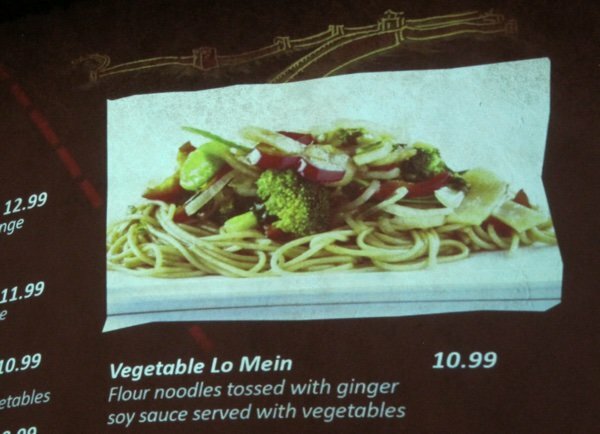 I am really happy there were some vegetarian options for your daughter at Busch Gardens!